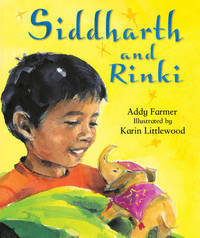 Siddharth dreams of India where he used to live. He doesn't like this new place - the cold, the grey and the strange food of England. Only his toy elephant Rinki understands. When Rinki gets lost at school, Siddharth feels more lonely than ever. His classmates join him in the search for Rinki and together they go on a great adventure that bonds them as a group. Addy is settled in a small town in rural North Lincolnshire. She has one husband, three children and six stick insects. She runs writing workshops, teaches in a special school, and writes, writes, writes. Addy enjoys walking up hills, reading, cycling down hills, talking to her family and friends and picking blackberries.